Travel with Darby through the segregated South of the 1960's, where he grew up, largely raised by his family's African American housekeeper, Maudie Mae. Darby's strong stance against racism and the Vietnam War often put him at odds with some of his elite family members and close friends. Accompany Darby to the Ivy League schools where he was enrolled as a graduate student: Tufts and Harvard. Go with Darby to antiwar demonstrations during the hippy era, when the advent of the pill led to "make love, not war" slogans. Experience Darby's crises and suicide attempts caused by his manic depression. Darby was usually aware that he was spiraling out of control but was completely unable to stop it. Learn from a masterful writer, whose undergraduate degree is in psychology, what that was like. At age 70, Darby has now enjoyed over 20 years of remission from bipolar episodes, thanks to psychiatric advancements. 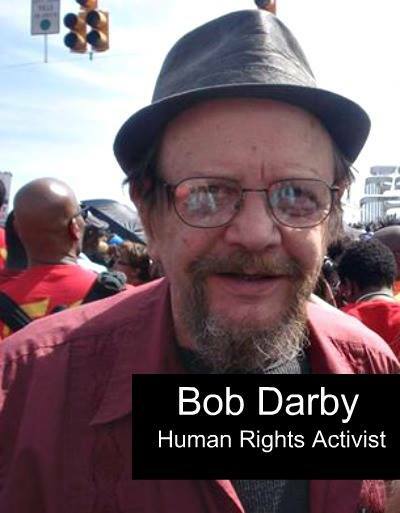 Darby founded the Atlanta chapter of Food Not Bombs. He wrote, "From 1994 until 2012, our small and informal band of unpaid volunteers served tens of thousands of free hot meals to Atlanta's hungry and homeless on sidewalks, in city parks, and in public shelters. For the first ten years of Atlanta Food Not Bombs, we did all of the cooking out of my own kitchen, serving more than five hundred meals of soup, rice, bread, salad, and fresh fruit." This year, Darby traveled to Washington, D.C. for SOA Watch meetings, and he attended the 50th anniversary of "Bloody Sunday" in Selma, Alabama. He remains committed to fighting racism, avoidable wars, and homelessness, particularly among the mentally ill.
Part of "Bloody Toombs" sales proceeds will help give Assistance to the Incarcerated Mentally Ill. Your purchase of "Bloody Toombs" supports AIMI's first fundraiser in eight years of operation. "Bloody Toombs" is a book that illustrates what happens when mental illness occurs in a family of means. Darby was a very intelligent young man who won full scholarships to two of the nation's best schools. But neither Darby's intelligence nor money from Darby's father, a judge, and his uncle, a banker, or the fact that they had influential friends could save Darby from experiencing psychotic episodes that led to hospitalizations, homelessness and jail. "Bloody Toombs" also demonstrates that mental illness is highly treatable, especially with the improvements in drug therapies that helped Darby gain stability and maintain it for over two decades, enabling him to make valuable contributions to society as a writer and human rights advocate. Homelessness, prison, and avoidable deaths must cease being America’s response to serious mental illness. AIMI thanks you in advance for purchasing "Bloody Toombs," an important memoir and allegory that we hope is successful like other great literature that takes readers through important periods of American history while relating personal stories: "Forest Gump" and "Having Our Say: The Delany Sisters' First 100 Years." We know you will enjoy reading "Bloody Toombs" and gain insight about social and ethical issues of universal application and concern. We hope you will write a review about this book at Amazon, where it will also be available within days. Thank you for helping to give Assistance to the Incarcerated Mentally Ill through your purchase of "Bloody Toombs," by Bob Darby. Thank you for your order of "Bloody Toombs."